Just in case you can’t tell from looking at the image above, this is going to be a political post. It isn’t that I have stopped obsessing about my sadly empty nest, its just that this is an election year. (You knew that, right? Even those of you raising toddlers?) And I am hopelessly addicted to news shows, political blogs and the POTUS radio station on Sirius/XM. While most Americans at this point are desperately trying to avoid any more information about the dysfunctional circus so laughingly referred to as “The US Government”, I find myself reading and listening with increasing intensity. I am absolutely wallowing in information, and the more I research and read, the more disgusted I become. Why am I disgusted? Well, I am a long time liberal. And when I say “liberal”, I mean the old fashioned kind of progressive thinker, like those lefties from the sixties. I have a somewhat “bleeding heart”, if that description means a person who believes that history will judge the success or failure of a society by the way that it treats its most vulnerable members. I believe that it is the duty of all of us to care for and support each other and I believe that it is the responsibility of government to protect the people; from foreign attack, from poverty, from want, from ignorance and suffering. I believe that government derives its power “from the consent of the governed” (to quote the Declaration of Independence). I don’t see anything like this kind of government in my country any more. I don’t hear any governmental leaders talking this way any more. I am disgusted because when I teach fifth graders about American Democracy, I tell them all about those who fought a Revolution so that they might create a nation based on the belief that “all men are created equal”. I talk to them about the power of voting and the ability of citizens to shape the government, to influence the government, to be a part of the government (you know, “of the people, by the people, for the people”). I teach them all of this, because these ideas are the way it is supposed to be. Nowhere in any textbook, reference book, children’s history web page or primary source document do I ever find a mention of the rich buying influence with the government. There is no mention anywhere of the Founders planning for the role of lobbyists, PACs, SuperPACS or think tanks. 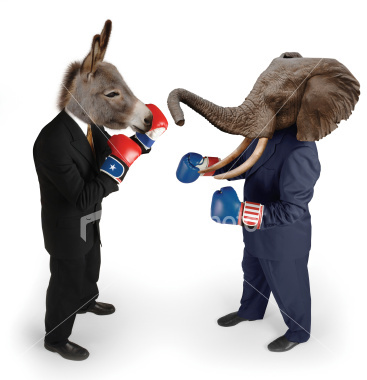 I am disgusted with the political situation in the United States today because what I see now are two huge political parties which spend hundreds of millions of dollars trying to prevent each other from ever accomplishing one single thing. I see them both changing their minds, twisting and warping the truth, refusing to acknowledge any good idea if it wasn’t their own. What could be more frustrating and demoralizing than watching the Republicans scream in outrage over the healthcare reform act which was conceived by the very conservative Heritage Foundation and based on the universal healthcare law that “severely conservative” Mitt Romney created in Massachusetts? How is it even possible that anyone believes them? I am hugely disgusted because BOTH of the major parties rake in millions of dollars from corporations and industries which then go on to shape the laws and “regulations” that are theoretically supposed to control them. Rules that are supposed to protect us from their greed and corruption. BOTH of the major parties are so dependent upon these dirty millions that they are literally unable to curb these corporations or the people who run them in any way. It is no longer any exaggeration, it seem to me, to say that the US Government is a wholly owned subsidiary of Wall Street, Madison Avenue and a handful of multinational corporations. Worse still is the fact that I now see the entire government, all three branches of it, as a closed system, like an elite club, which is determined to keep out anyone who refuses to play this corrupt game. If you are a candidate for public office, but you are neither a Democrat nor a Republican, you won’t get on any debate stages, no matter who you are. You won’t get interviewed by CNN, or MSNBC or FOX. The New York Times and Washington Post will act like you are invisible. You want to join the club, get the millions and get some headlines? Join one of the big parties and play by the rules. Don’t even think about anything as outdated as the truth. Don’t even whisper the word “compromise”. Oh, and once you get elected, your main job will be to keep sucking up to the money machine so your team can keep its power (or get more). While doing this, it is also vital that you say anything you need to say to make voters think that every good idea is from your team, while anything suggested by the other team is dangerous, treasonous and/or insane. I am disgusted because what we call a fair and open election is really an incredibly expensive battle between two groups who have only one objective: Beat down the other side and get more power for us. Any pretense about governing in the best interests of the electorate is long gone, from what I see. So what is a cynical patriot like me supposed to do? I have many friends on both the left and right who vote for the party which they feel is “less corrupt” than the other. I’ve done the same thing (my votes for Bill Clinton come to mind), but I can no longer take this path. The ball just keeps passing back and forth from Democrats to Republicans and back again. Neither side is standing up for the kind of liberal ideals that I so strongly believe in. Neither side is able to disentangle itself from the clutches of big business; nor is either side expressing any real desire to do that! For me, the only choice now is whether to vote Socialist or Green Party. Oh, and I will join as many anti-corruption marches as I can find. Just call me one of the 99%. This is a great post. It’s especially timely since the Koch Brothers are having a convention this weekend in San Diego to gather other super-rich people and get them to write checks to Koch-supported groups. The Kochs themselves have already pledged $400 million in 2012 spending. This should be the big news story, this should have everyone’s attention and outrage, but the media will cover meaningless, surface campaign events. The Sunday talk shows should be Koch, Koch, Koch, but they will be “advice” for Mitt and Obama, nothing about the real powers behind the throne. Politics has always been corrupt. I grew up in Boston, for heaven’s sake! But not like this. We’ve lost our country — not to Russia, not to China, not to Islamic extremists, but to an oligarchy run by the Kochs and their peers. So how can you and I DO something about this? In all seriousness, I want to act in some way…..How do we effect change? If I knew I would be doing it! I spent a year of my life away from my husband and dog working on a campaign for a guy whom I believed couldn’t be bought by the special interests and who genuinely cared about people. I’m not leaving home again! OK. I get it. I know. But still…..I May have to take to the streets with my revolutionary offspring. This is just so sickening. Listen to Pete Dominick on POTUS radio: he is one of us! I think if Obama is re-elected with the economy still so bad, the GOP will really have to do some soul-searching. This country is remarkably resilient. We got the New Deal and the Great Society when we needed them. Embattled Farmers, I think you’re right. In fact that is what I am praying will happen. Something has got to break the back of the Republican party as it stands now. I can’t tell you how disenfranchised and disgusted the Republican friends I have (including my husband) who are fiscally conservative but socially responsible/liberal are feeling right now. They don’t want to go near the party. You wouldn’t know these people existed because of the discoloration of the party by the Tea Party. I think that there are so many moderates who are waiting for a dragonslayer to kill of the influence of the rapid uber right-wing conservatives. I think if President Obama wins and it looks as if Hilary will take up the baton in 2016, the Repubs will have to be “born again” in a way that exorcises the Ayn Rand, neo conservative, Sarah Palin-Tea Party Express right into the pit of Hell where it belongs. As to the big money, we need to continue to make as much noise as possible via our online “conversations” so that the Supreme Court modifies its foolish decision about campaign finances, and then we need to continue to “roar” against the influence of lobbyists until the laws change. If Jim Crow Laws could be overturned, we can win this battle. Blog on, Momsheib! Excellent comment! What else can we do? Petition, scream, rant, and demand that “Citizens United” be overturned. We need serious campaign finance reform, not this ongoing distortion of the process that we have. And, yes, at some point, eventually, the sane Republicans are going to realize that the party they called their own is hopelessly, and irrevocably lost and doomed and they’ll go somewhere else. I have hope! My frustration is that we ARE ranting and marching and yelling, and yet no one in power is listening. In EITHER party. I agree that the Republicans on the far right are at the moment the most egregious group, but I have no belief that the Democrats want things to change either. How do we get the media to cover our feelings, our beliefs? How do we get other parties some publicity so that at least we have a real choice? I’m going to post this comment both here and on my post that led you to link me back here, Moms. And I’m glad you did. I hear your pain. I agree with much of what you say, because I feel as you do. A liberal who believes that the measure of a society is how it treats its members. Check. Someone who wants to get rid of the influence of money, of Wall Street of Citizens United. Check. Someone who wants the media to pay attention. Check. The place we differ is that I don’t see the Democrats and the Republicans the same way at all. The media has this circus where they pretend to show both sides, and where they pretend both sides are equal. They are not. The Republicans are trying to destroy every single safety net that has been put into existence since FDR cleaned up after Hoover. Every single one of them. And they vote together even when they don’t believe in that vote. It doesn’t matter what they believe. They are a unit. And they don’t care about the lower class. They don’t care about the middle class and they don’t even care anymore about the upper-middle class. They care about themselves and their rich buddies. Period. Third parties, sadly get nowhere in the U.S. Ever. It is a reality that I find truly awful, but it is what we have. I’d love to change it. I would love to have true choice. But I am not joking when I feel like my vote for John Anderson in 1980 helped elect Ronald Reagan (who started this whole problem in my mind.) Votes for Nader (with an able assist by the Supreme Court) gave us Bush. On the other side, votes for Perot only hurt George H.W. Bush. I don’t see is how a vote for anyone other than the Democrats get you into the ballpark. Voting for a third party candidate today is simply throwing away your vote. Worse, it will elect Mitt Romney and the Republican Senate candidate (Eliz Warren for you, George Allen (God Help Us ALL) for me). In a better day, there were lots of people in the middle, and some on either extreme. The only folks in the middle, where legislation actually passes, are being ousted by the extremists. Texas will send another crazy man to the Senate. He will vote in lock-step with the rest of the cretins to repeal health care, to cut back social services, to turn back the clock on women’s issues. And then there is the media. But that is another round entirely. I understand your points and your passion and your hopes and fears. I share them. Until we can change them, there is only one way to vote. DEMOCRATIC.